The above image comes from the May LEGO Store Calendar which confirms that the Han Solo minifigure (5001621) will be the “May the Fourth” exclusive for 2013. 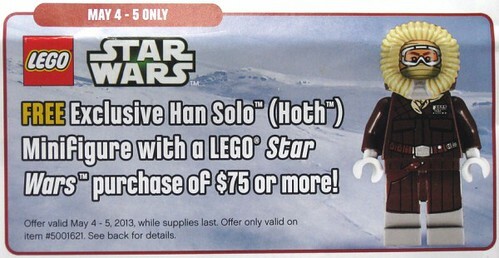 This Hoth variant of Han is FREE with any LEGO Star Wars purchase of $75 or more. Remember that the Red Five X-wing Starfighter (10240) will also be released May 4th so that will easily satisfy the $75 purchase requirement. The “May the Fourth” deal will only be available May 4-5. As we reported yesterday, the Hoth Han Solo will be dressed in a brown coat and a removable hood. Previous articleLEGO Star Wars Han Solo May the 4th Exclusive Minifigure?